Here is a brand new James White masterpiece I just received today. The work in this cue is fantastic. I wish my pictures could do it justice, but I just can't pick up all the intricate silver work in the cue. The log points are Ebony recut into Holly, recut into Ebony, and recut again into Holly. The shadow points are Ivory. The diamonds are alternating Silver and Ivory. 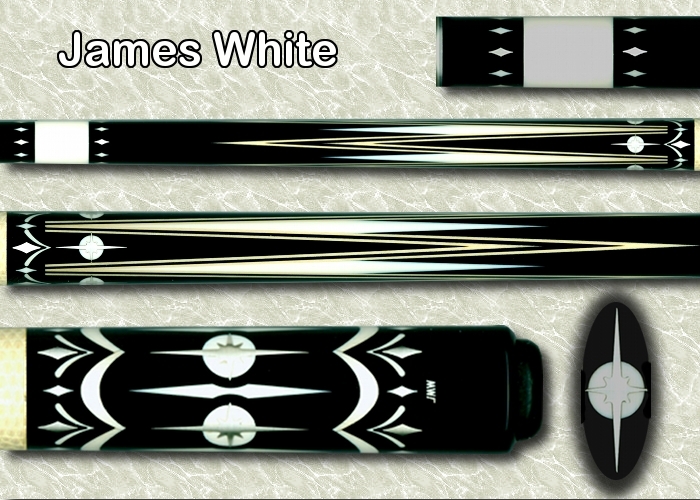 James put on a white real lizard wrap that compliments the cue nicely. Thanks to Spanky for helping with the design of the cue, and thanks to Big Jim for beautifully executed cue. Enjoy! You can totally see the Mottey influence here. SWEET! this is an amazing piece. Jim has great execution and this design is fantastic. new and innovative. props to those who had input on this cue. If you don't mind me asking what was the lag time from order to front door??? Thanks for the kinds words from everyone... obviously all the credit goes to Mr White. I was told about this cue being in progress at VF and did not have a home, so I jumped all over it. Spanky and Big Jim came up with the original design and I was able to provide some input also. Jim sent progress pics of the cue to me. I would say the wait would have been somewhere between 1-1.5 years.